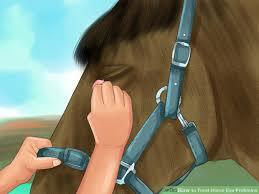 I’m next to a dark brown mare, as she gently pushes her big long head into my chest. It feels good rubbing against my sore pectoral muscles, like a massage. I reach out my left hand to stroke the right side of her face, feeling the soft hair. I notice something alarming inside the upper corner of her right eye, a raised dark spot like mold on an old piece of fruit. As I look closer I see it’s a beetle! My instinct is to pull it out immediately — how can she even close her eye with this obstruction? 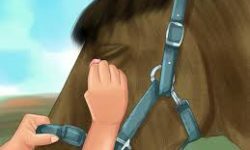 Then I hesitate, thinking maybe the bug’s feet have a grasp on the mare’s eyeball, and removing it needs a more careful approach. My sister the large animal veterinarian is on the far side of the horse doing something else. I call to her to come look at this. She doesn’t seem interested which puzzles me. Our father, who grew up on a farm and is also familiar with horses, tells me “You know, eye health is closely connected to gut health”. Is he saying the beetle is indicative of an intestinal “bug”? I seem to be more worried about the horse than anyone else, badly wanting to do something to help what looks like a big problem. My father can sense my concern. He says soothingly “She doesn’t have eye cancer”. ACK! I wasn’t even thinking of that! I wake up, remembering I asked for a dream about vision, since I haven’t had one in a while. The meaning here is not immediately obvious to me. I recall the video series “Truth About Cancer” which I watched a week ago, with many speakers talking about healthy lifestyle and good nutrition to keep the body disease-free. I wonder what this dream is saying about my own eye health, or that of my clients. Most people who come to me for vision help have a tendency to anxiety and worry, as I do myself. Is excessive worrying a “bug” in my thought patterns (dreams are full of puns) which is interfering with my eyesight? The Bible verse about judging another occurs to me. “Why do you look at the speck of sawdust in your brother’s eye and pay no attention to the plank in your own eye?”. This sounds more like the current political climate in the USA than anything else! Maybe I need to spend less time following the upcoming presidential election! And of course I can always use the reminder not to judge others. We’re all doing the best we can, given what we know. The horse here seems steady and peaceful, just watching us, not restless or appearing to be in pain. Since every character in a dream represents a piece of the dreamer, maybe I need to be calmer about my vision, appreciating what I can see and not obsessing about what I can’t. And I’ve got the support of my wise knowledgeable sister and my wise father (who had excellent distance vision his whole life) as examples. Lots of “horse sense”!